I’ve never been too fond of collaborative books with more than 3 authors, it strikes me as all gimmick and no worth. There are, I’m sure, exceptions out there, but I don’t think I’ve read them. Even those with only 2 authors need a lot of work if they aren’t too be jerky and off putting. Think I’ll avoid this one. How wonderfully damning. Such a shame that a book that should be wonderfully Irish, instead resorts to stereotypes. On a related note, check out the news on the first decoded “Irish” genome. @Suder “Of the SNPs, 13% were novel, potentially including markers specific to Irish ancestry or indicators of disease. In particular, one of the new SNPs interferes with the production of a macrophage-stimulating protein, thought to be associated with inflammatory bowel disease and chronic liver disease.” Oh ‘yay’! @Fence It’s a misbegotten experiment almost from the start. I only wish Roddy Doyle had better collaborators. As a satire of Irish society it fails completely. As a pisstake of Joycean scholarship, it just manages to be snide and obnoxious. If the group had attempted to revamp ‘Dubliners’, and each submitted a seperate short story, it may have had a better chance. Didn’t Doyle have a similar collaboration a while back, different chapters by different author, although I think they were more stand alone with an overarching theme, Hotel or something is in my head. I may be wrong though. I believe there’s been at least three ‘collaborative’, books with Doyle and sundry others. 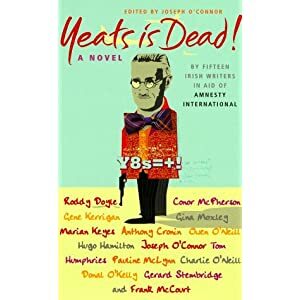 I will confirm the titles, but Yeats Is Dead is the only one I’ve read so far. He’s a very interesting writer. Back in the nineties Doyle adapted his own television show – Family – for his novel The Woman Who Walked Into Doors. I don’t know how it holds up today, but when I was a teenager I found it very moving. Yeah, both Family and The Woman Who Walked Into Doors are both great, they really stuck in my memory.